At Dolphin Marine we can supply swages 1.5mm up to 6.5mm in nickel plated (Chrome) bright copper for stainless steel stranded wire or aluminium swages for galvanised stranded wire. 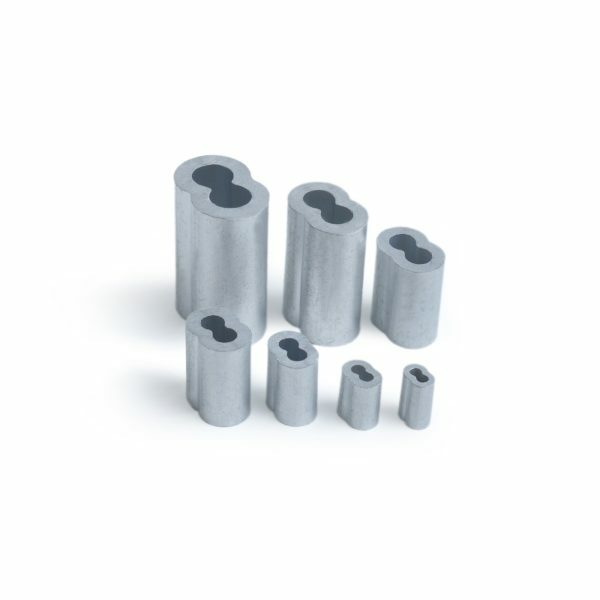 We also stock a full range of machine press “hydraulic” ferrules in the same sizes for industrial clients. Dolphin Marine swages have been used in Australian industry from mining to riggers, yachtsmen, marine chandlers, gymnasium equipment, hospital & therapeutic beds & equipment, architectural rigging such as balustrading, awnings, pergolas & lighting. Widely used in the commercial fishing industry & for the security of valuables in showrooms. Dolphin Marine can supply ALUMINIUM hand swages 2.4mm up to 6.4mm for galvanised stranded wire. 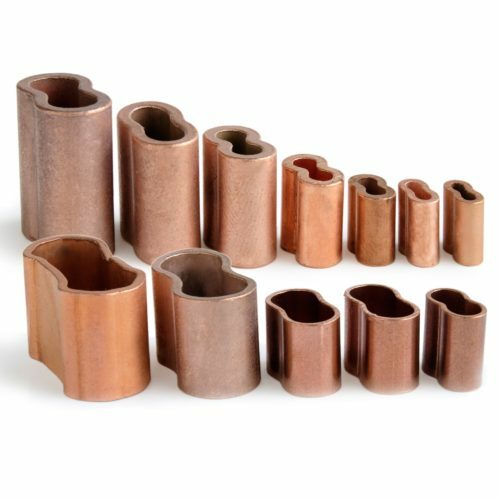 We also stock a full range of machines press “hydraulic” machine press ferrules 1.5mm up to 7.0mm for industrial clients. Copper swages can not be used on GALVANISED wire as the copper will react with the galvanised coating. Aluminium swages are used in this situation. Also used for plastic coated wire where personal protection from wire dags is required. Public barriers & entry guides in shops, theatres etc. Galvanised wire is used in many industrial applications as an economical alternative to stainless steel wire, such as fencing, security, industrial lifting, hanging lighting & other fittings in factories & warehouses, displays, signage & industrial machinery etc. Dolphin marine alloy hand swages are produced locally from high-quality material by our own staff in our Brookvale premises. Dolphin swage tools are a heavy duty full bite tool that will crimp a swage in 2 – 3 bites of the tool depending on swage size compared with 5 -6 bites of other swage tools, not to mention the time saving for professionals doing many swages in a day. The advantage of fewer bites is a much smoother & neater finish with less ridges or burrs to catch on clothing, sails etc or cuts & scratches to personnel. The smallest Dolphin Marine swaging tool has 450mm or 18″ handles compared with 350mm or 14″ handles on many imported tools, therefore requiring less effort to achieve a smoother finished product. Dolphin Marine swage tools are made from low carbon, high nickel alloy ensuring accuracy & adherence to specifications. 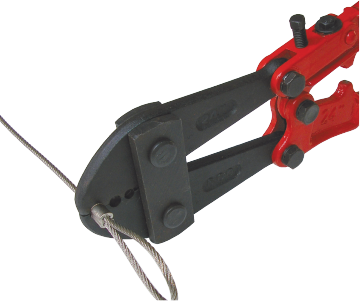 These tools are capable of many years of trouble-free, hard use in factory or site situations. See instructions for the correct use of the swage tool. Hand Swages are available in Bright or Nickel plated finish. Dolphin swage tools are made from low carbon high nickel alloy ensuring accuracy and adherence to specifications. Capable of many years of trouble-free hard usage in the field or factory situation. 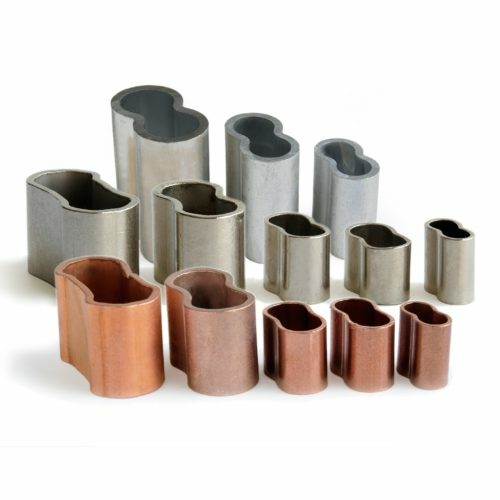 Dolphin Marine Hand Copper Swages for Braided Stainless and Galvanized wires. Synthetic Ropes, Cords, Shock Cord, manufactured 99% pure Copper drawn to shape & annealed. Dolphin Wire Rope Cutter jaws are manufactured for long life and accurate clean cutting of braided multi-strand wire ropes. 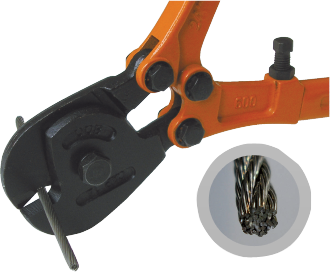 the Dolphin Wire Cutter cuts an extremely clean edge ensuring ease of use. These cutters are not recommended for cutting bars etc.